Fallout is a super popular post-apocalyptic action RPG shooter series, and the newest game, Fallout 4, was recently released. It’ll probably end up being one of the big Christmas titles this season, so you’ll want to be prepared with the Fallout 4 Vault Dweller’s Survival Guide. It’s a robust, super-thick paperback strategy guide, and we’ll take a look at a few sample pages in this review. 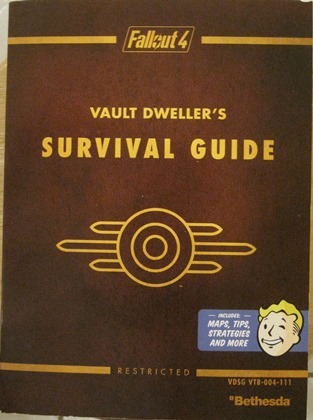 One neat thing about the guide is that they wrote it like it was a survival book for vault dwellers venturing into the radioactive outside world. They warn you of dangers, discourage you from going outside at every turn, and there are plenty of funny pictures of Vault Boy. 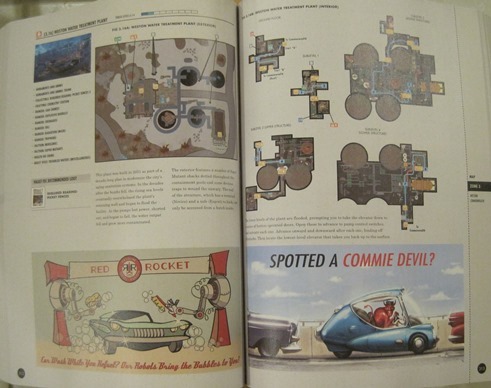 Plus they scatter various ads and propaganda from the game every few pages, so it’s a fun read. Here’s a closer shot of the cover. 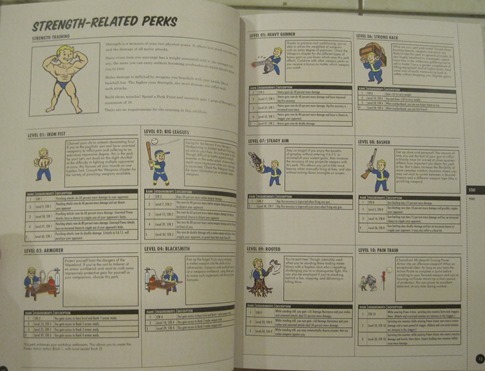 Other parts in the intro include a guide on weapons, apparel, armor, and other goodies. 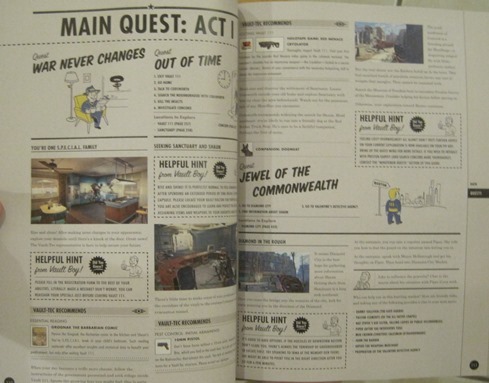 After that is the guide to main quests. Here is an example page from that. I wish they could’ve put in maps on the same pages as the quests, but the guide is pretty big enough as it is! After that is a radio guide and an appendix, and that’s all that’s in the guide! My only problem with it is the text is a little small, but other than that, I think this would be a must-have book for any Fallout fan. While some of the mock ads are a little racy, the rest of the guide is fairly readable for all ages. But since it’s a guide for an M rated game, keep that in mind when you’re around kids. So, you playing the game as well? I’d be interested if I had more time. No but my brother Jeff is playing it and he found the guide very useful. I don’t think it became a shooter until 3. Some of the old PC footage of the game looks almost like a turn-based RPG to me. Anyway, I love themed strat guides like this. I never beat Paper Mario, but read the guide. 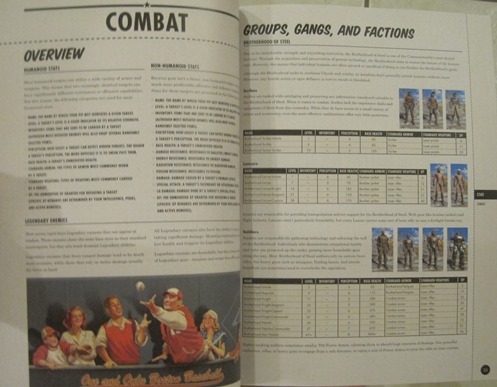 I liked how OoT’s guide was written kind of like a story, but I never bought it cause … well didnt need it.